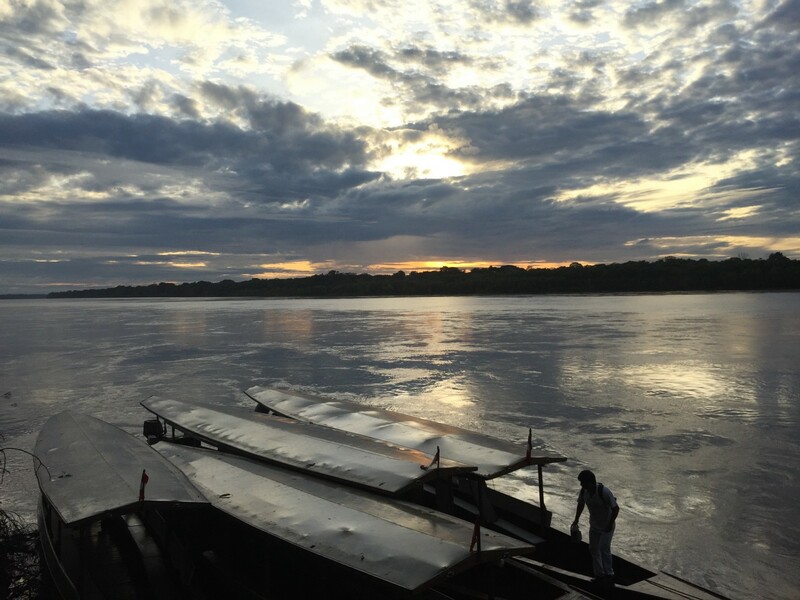 We boarded the motorized canoe at 5am, ready to travel another three hours along the swollen Madre de Dios river towards the Bolivian border. The sun was already coming up and a large group of green parakeets chattered away, clustered on the mud bank rising high above the river. “Wait, I forgot my machete,” said Luis, our guide. My husband and I looked at each other. 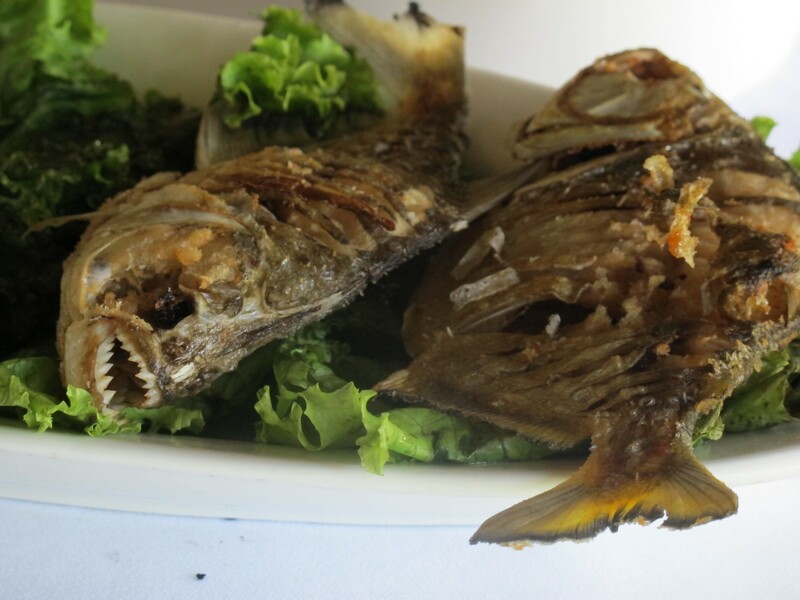 As we were heading off to swim and fish for piranha in Lake Valencia for the day, we weren’t sure whether the machete was just to kill the fish or a precaution against something larger taking an interest while we took a dip. By this stage of our five-day stay in the Amazon jungle, we were getting used to this. The magical thing about the rainforest is obviously the incredible diversity of life all around you. 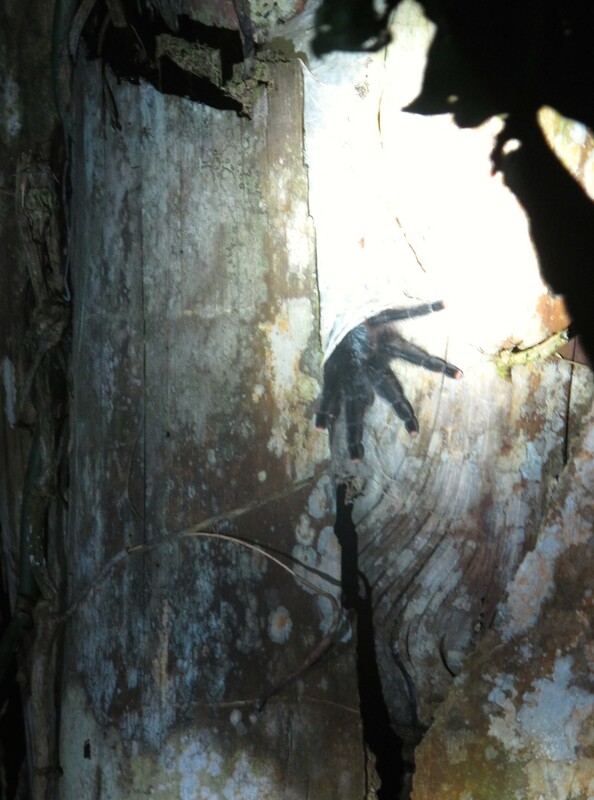 At the lodge where we stayed, a 45-minute canoe ride from Puerto Maldonado in the south east of Peru, a pink toe tarantula had made its home in a tree trunk outside the guide’s office. Baby caimans, closely related to alligators, hung out under the bridge linking the main lodge with the sleeping cabins, and tamarin monkeys casually dropped their discarded fruit husks onto our heads from the trees above. But there are plenty of hazards, and I don’t mean big predators like jaguars or caimans. It’s the small, seemingly innocuous things. 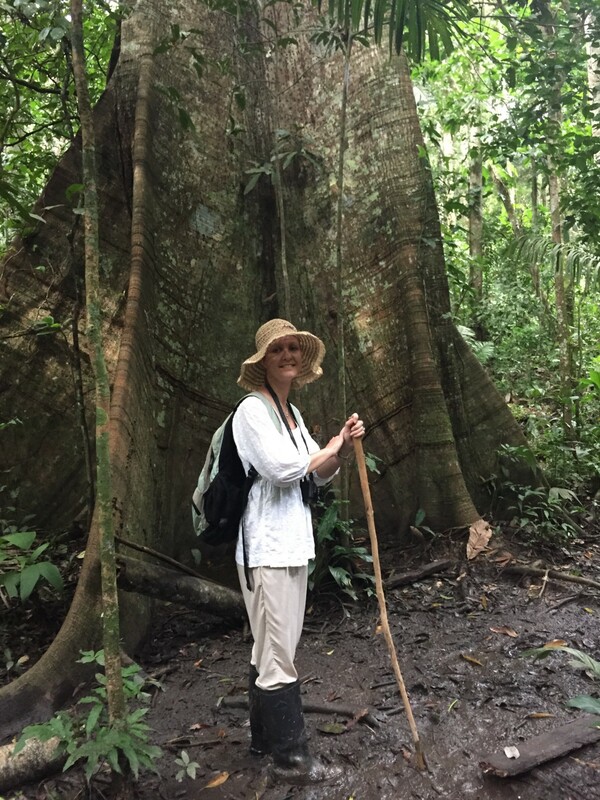 Hike into the jungle and a single sting from a bullet ant, one of over 1000 ant species in the Amazon, can leave you in agony for a day. That tree that you’re about to grab for support as you wade through the mud could be a dynamite tree, covered in large thorns, with sap that can temporarily blind you if it gets in your eyes, and fruit that explode, when ripe, spewing out seeds at over 100 miles an hour. Or, as we discovered, the leaves that you just ducked under on the trail could conceal a beautiful, furry, red, white, black and highly poisonous caterpillar underneath. “Don’t touch it,” called out our guide, Paulo, who was leading our muddy progress through the dense undergrowth on that occasion. We weren’t about to. We realized pretty quickly that we’d be better off not touching anything. “Is this spider dangerous?” my husband asked about a medium-sized specimen that we skirted round warily during a night walk by the lodge. It was one of a dozen different spiders that we spotted with flash lights that night, but although this one was completely still, its body was taut, and it looked poised, ready for action. “It’s venomous, but not dangerous,” said Luis. With so many potentially deadly species in the Amazon, ranging from ants to anacondas, anything that can’t kill you is a pretty low-grade menace. For us, this was all an incredible adventure, before we jumped on a plane and went home. No phone or internet! Limited electricity! A gazillion mosquitoes! Ants that can kill you! For people living and working in the Amazon, it’s clearly a different story. The main industries in the jungle around Puerto Maldonado, other than ecotourism, are Brazil nut farming, logging and gold mining. All are dangerous. Paulo, a former Brazil nut worker, outlined the hazards of that job. His boss, the owner of the Brazil nut concession in the jungle, paid him for each sack of nuts he filled, which meant hauling 100-pound sacks, sometimes knee deep in mud, through the jungle during rainy season. First, though, he had to avoid maiming himself with the machete he used to harvest them, being hit on the head by nuts falling from the very tops of trees, which could have killed him, or being bitten by the snakes that came to eat the animals foraging for fallen nuts. By contrast, working as a guide at a remote ecolodge was easy, despite the long hours and being separated from friends and family for weeks at a time. For people who get lost in the jungle, without food, enough water, shelter or any means of communication, its dangers can be terrifying. A few weeks before we arrived, a group of volunteers for a nearby animal conservation center got lost after their inexperienced guide took a wrong turn. The guide went off to get help, but the volunteers weren’t found or rescued for eight days, which they survived by eating seeds and drinking rainwater. We discussed the story of the lost volunteers with Paulo, who said that one of his friends once got lost in the jungle for two weeks, before stumbling upon a trail, which he managed to follow until he found help. The friend recovered from his physical ordeal, but spent months in a psychiatric hospital in Arequipa. Why, we asked? Paulo said he wasn’t sure whether he was bitten or stung or ate something that altered his mental state, or whether it was the psychological trauma of being completely alone; without knowing what he could safely eat or drink; if he could rest without being eaten, bitten or stung; or whether he would ever make it out alive. That kind of put our Amazon adventure into perspective. 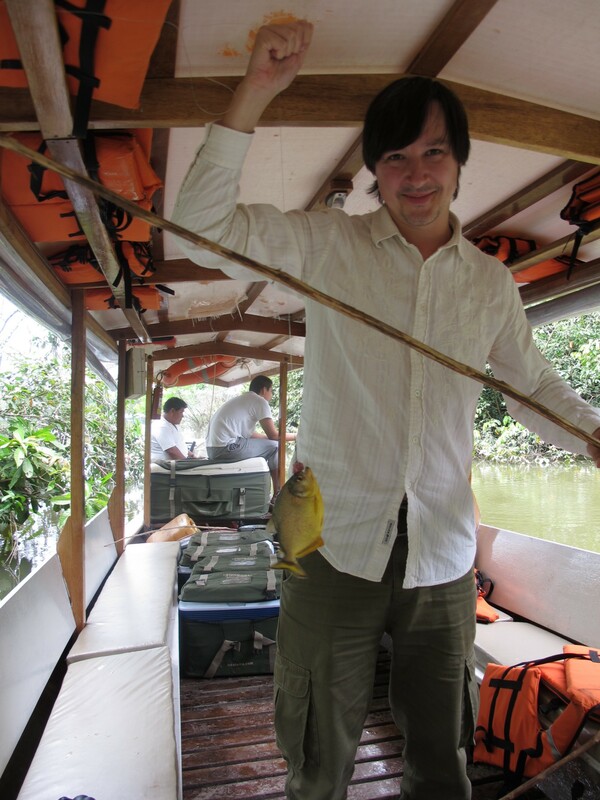 We ended up catching about 30 piranhas in a couple of hours that day on Lake Valencia, easily flipping them into the boat using a hook and line on the end of a bamboo cane. A couple of times, we flipped a little too enthusiastically and a piranha would fly over the canoe, splashing into the water on the other side, prompting gales of laughter from our skipper. But they are plentiful and pretty easy to catch, because local fishermen don’t bother with a fish that has so little meat. This was just for the tourists. We fished for piranhas, got bitten by a piranha (but only getting the hook out of its mouth) and lunched on piranhas by the side of the river. They were actually pretty tasty. Then it was time to take a cooling dip in the middle of the lake, jumping off the side of the canoe. Luis told us that swimming with the piranhas was fine and laughed about their Hollywood reputation of craving human flesh. Then he mentioned that black caiman and anaconda also live in the lake, but don’t venture into its deepest waters. We looked at each other again; my husband jumped in anyway. It was only later on during our beautiful, sun-dappled river journey back to the lodge — sloths, capuchin and howler monkeys! — that Luis told us about the time he’d spotted an anaconda around 30 feet long, sunbathing close to where we’d just been fishing. He said that he decided to take the measure of the couple that accompanied him that day before alerting them to his discovery, which was still basking nearby. Kathryn Tully is a freelance journalist based in Brooklyn, New York. Twitter, Instagram: @KathrynTully. Website: www.kathryntully.com.